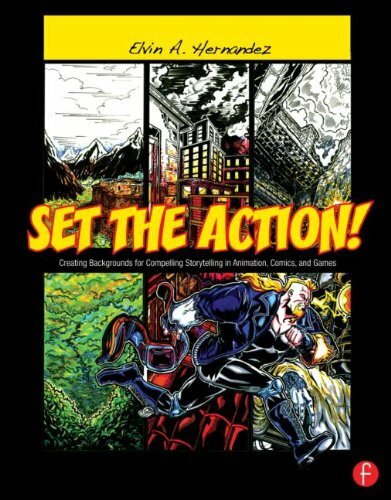 Set the Action is a book on creating backgrounds authored by Elvin A. Hernandez. It's text heavy with plenty examples and they are well explained. Focus of the book is on it takes to make the environment believable, and hence the story believable. For example, if a character is a dirty fellow, his home should not be spotless clean. There's stuff on what props can be put into the scene, coverage on the different art styles, textures. The perspective section is surprisingly quite brief. There's not much on talk specifically on animation and games. In particular, games nowadays feature such realistic environments I suppose there would be something to talk about. This book is more for the intermediate and above artists who already know how to draw characters and just missing information on how to create backgrounds. I've found some preview pages from Google Books and have embedded them below. Read some pages to get a clearer idea of the book.